Try one of our brand new Gypsy Wagons – they are a great choice for couples who aren’t ready to go the “rustic” route of the tent cabins, but don’t need the extra space in the Ranch Cabins. Plus they are adorable! The Gypsy Wagons are fully enclosed sleeping cabins with their own private bathroom with shower. These cabins also have electric lights, and limited outlets*. Furnished with a queen OR twin beds, as well as a table with chairs, guests will find these unique cabins to be quite comfortable. 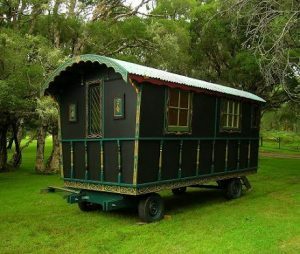 Online reservations for Gypsy Wagons now available. Or contact our friendly reservation office to book all the details of your Stehekin vacation. Not actual Gypsy Wagon. Similar design to what we will have. *Our electrical system runs off of solar power and batteries. It is more than satisfactory for items such as CPAP machines, but cannot handle higher powered devices such as hairdryers. Please leave these items at home. For more information on our power system, please refer to our FAQsection. 10% of the total cost of stay is nonrefundable. 100% of deposit is nonrefundable unless we are notified in writing (email is fine) 30 days prior to your scheduled arrival. If your reservation is made less than 30 days prior to your scheduled arrival the deposit is non-refundable. Total cost of your stay plus tax is due upon your arrival. 50% of the cost of unused services will be refunded. We highly recommend you purchase travel insurance. Unexpected events happen, which can cause you to cancel your trip. To guard against losing your deposit, you can buy travel insurance for a small fee. If you wish to purchase travel insurance, go to TripAssure , or other online travel insurance sites for details and to purchase. In the heart of the North Cascade Mountain Range. Remote by design. To get here you are going to need a good pair of boots, boat, ferry or float plane.